It’s that time of year again… time for The Great Food Blogger Cookie Swap! Hosted by Julie from The Little Kitchen and Lindsay from Love & Olive Oil, the cookie swap benefits Cookies for Kids’ Cancer, a non-profit organization committed to funding new therapies used in the fight against pediatric cancer. Since 2008, Cookies for Kids’ Cancer has helped to fund four dozen childhood cancer research grants, leading to nine promising new treatments now in clinical trial that are available to children fighting cancer today. This year is my third year participating in the cookie swap. After making a small donation to Cookies for Kids’ Cancer, each participant is sent the names and addresses of three other food bloggers to send cookies to. In return, three other food bloggers send us cookies! Very awesome, all around. In 2012, I sent out Lemon Crinkles. In 2013, I sent out three types of cookies – Cookie Butter Cookies, Gooey Stuffed S’mores Cookies, and Sweetened Condensed Milk Cookies. This year, I was matched with Brett from Green Thumb White Apron, Sara from Sara Ran Away With The Spoon, and Sarah from Sarah Cooks The Books. Lately I’ve been busy enough that I rarely bake anything during the year – so I decided to go all out, and bake four different types of cookies to send to my matches, since this is my only excuse all year to bake! The first cookies I knew I had to make were these Date Nut Bars, which my late maternal grandmother used to make when I was a kid. I LOVED these as a kid, and still do as an adult! Secondly, I’ll take any excuse to make these Gooey Chocolate Peanut Butter Cup Cookies from SugarHero! I made them a year ago, but never got around to posting about them, so I figured this was the perfect opportunity to make them again. 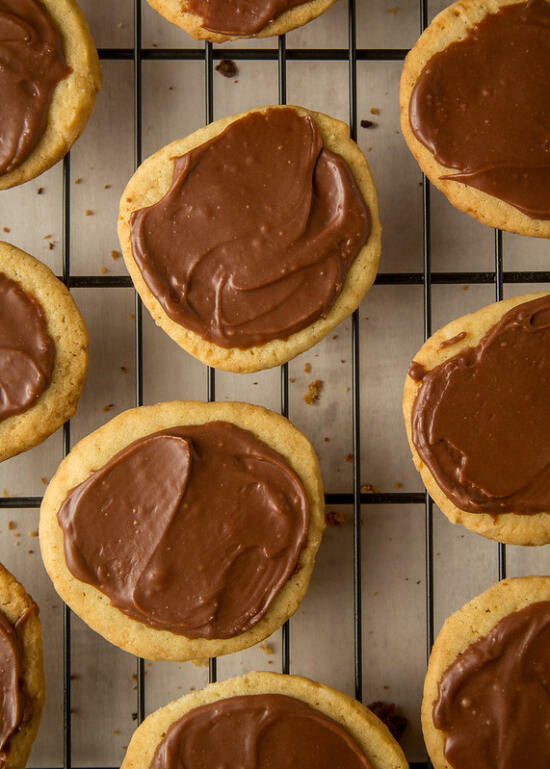 The third type of cookie I decided to make were these Vanilla Refrigerator Cookies topped with Chocolate Ganache – another family recipe from my grandmother. A family favorite. And lastly, I wanted to make something that Son would enjoy, so I decided to try these Pistachio Cookies. … and Mexican Wedding Cookies from Kristi of Inspiration Kitchen. In addition, since my friend Allison Boyer and I were both doing the cookie swap, we decided to send cookies to each other as well! She sent me these tasty Gingerbread Cookies that I have demolished. I love gingerbread! If you missed this year’s Great Food Blogger Cookie Swap, sign up to be notified about next year’s! It’s great fun, for a good cause… and who doesn’t like getting yummy cookies in the mail? 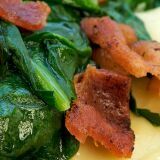 When remembering my grandmother, everyone talks about the food she made. Especially her wontons. Always her wontons. She would make huge batches of wontons for family gatherings, for her coworkers, even to sell at fundraising events when my mom and her siblings were in high school. (Four wontons for 25¢ – what a deal!) When she passed away a couple of months ago, several people, from different parts of her life, stood up to share their memories of her. Every single one of them mentioned her delicious wontons. I’ll always remember her wontons, which still make an appearance at family gatherings. I’ll remember the white chocolate peanut butter ritz cookies she kept in a bag in her freezer, that she would stealthily send home with my brother because he loved them so much. I’ll remember her yam pie, which is way more delicious than any pumpkin pie I’ve ever tried. But most of all, I’ll remember her date nut bars. As a child, they were my absolute favorite thing that she made. (Which says a lot, because there’s a good reason why she’s so fondly remembered for those amazing wontons of hers!) Even though they sound healthy, they were always a huge treat when she made them. And now, even though it’s been years since she’s made them, all it takes is one bite to know that yes, this tastes exactly right. Although they seem simple, and maybe a little boring, these are easily the favorite of the four cookies I made for The Great Food Blogger Cookie Swap – even more so than those scrumptious Gooey Chocolate Peanut Butter Cup Cookies! Mix flour, cinnamon, nutmeg, cloves, and salt. Beat sugar and butter in a large bowl with electric mixer until light and fluffy. Beat in eggs, one at a time. Add dates and dissolved baking soda. On low speed, gradually beat in flour mixture. By hand, stir in nuts. Chill several hours until firm. Heat oven to 300°F. Line baking sheets with parchment paper. Form dough into rolls, about the thickness of your index finger and about ten inches long, on a lightly floured surface. Place two rolls five inches apart on each prepared baking sheet. Flatten rolls so they are about two inches wide – they will be very thin. Bake for no longer than 15 minutes. 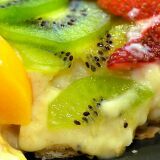 While hot, cut into one-inch slices. Cool on baking sheets for about five minutes, then remove to cooling racks and let cool completely. Makes about five dozen. Who doesn’t love the combo of peanut butter and chocolate? 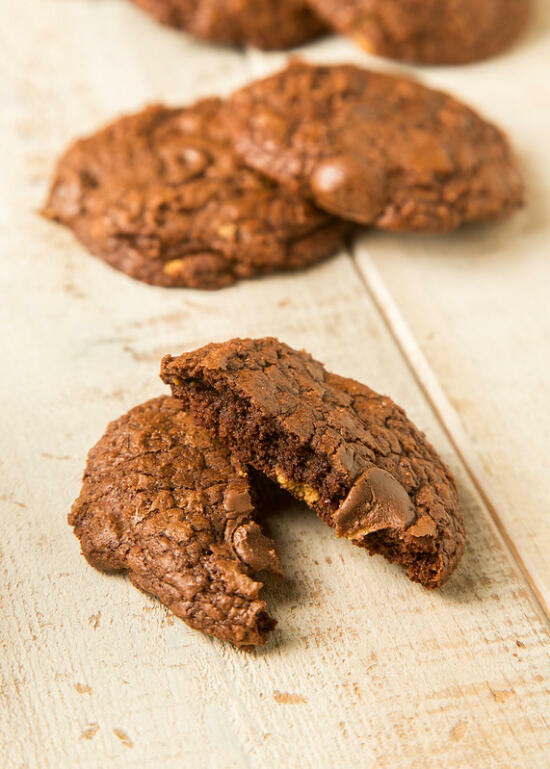 These oooey, gooey, rich chocolate peanut butter cup cookies are the perfect way to get your chocolate peanut butter fix. I love them so much, I’ve made them twice already! Gooey Chocolate Peanut Butter Cup Cookies, from SugarHero! Combine the chopped chocolate, peanut butter, and butter in a microwave-safe bowl, and microwave in 30-second increments until completely melted and smooth. Stir every 30 seconds to prevent overheating. Let the mixture cool to lukewarm. Place the sugar and eggs in the bowl of a large stand mixer, and beat with a whisk attachment until thick and foamy, about 5 minutes. Add the chocolate mixture and the vanilla, and mix them in until they’re incorporated. Scrape down the bottom and sides of the bowl, as the chocolate has a tendency to sink to the bottom. Preheat the oven to 350°F and line baking sheets with parchment paper. Use a large 1/4-cup scoop to scoop large portions onto the baking sheets. Cut the remaining peanut butter cups in half, and press a few of them on top of each cookie. Bake the cookies until they look dry and crackly on the top, but the center is still very jiggly and soft when pressed, about 9-12 minutes. 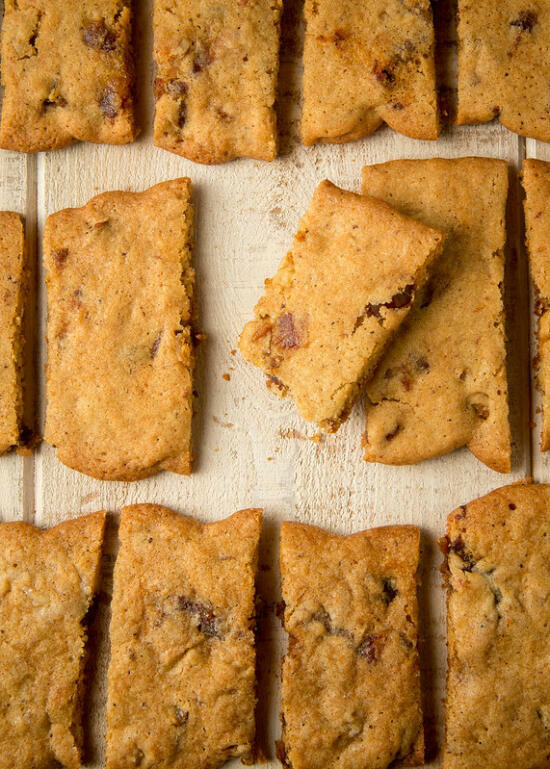 Cool the cookies on the baking sheet—if you try to move them too soon, they’ll fall apart. Once cool, store the cookies in an airtight container at room temperature for 3-4 days For the best taste and texture, microwave them for a few seconds before serving, so the centers get warm and gooey. 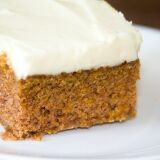 I’m not sure where this recipe originally came from, nor do I know who this “Susan” is, however this recipe has been in my family for years, showing up at gatherings every now and then. The cookies are very delicious on their own. But we all know that chocolate makes everything better, and this is absolutely true for these cookies! However, chocolate or no chocolate, these cookies are crazy easy to make. Even better, being “refrigerator” cookies, they’re super easy to make the dough ahead, and then you can easily bake a few whenever you need a cookie fix! Sift flour, soda, salt. Mix shortening with sugar, egg, and vanilla until very light and fluffy. Gradually mix in flour mixture and nuts. Turn dough onto large piece of waxed paper. Shape into roll 1 1/2″ diameter, then wrap. Refrigerate several hours, overnight, or several weeks if desired. Start heating oven to 375°F. With sharp thin knife dipped into hot water, then wiped dry, slice roll 1/8″ to 1/4″ thick (slice off only what you need, return rest of roll to refrigerator to bake later). Place on ungreased cookie sheet. Bake 10 min or until done. Cool completely. 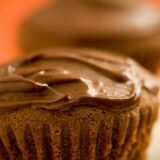 If desired, make a batch of chocolate ganache and, using a butter knife or spatula, spread each cookie with ganache. 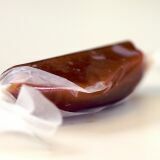 Let cool completely, until ganache has hardened. Store in a tightly covered container. Makes 5 dozen. 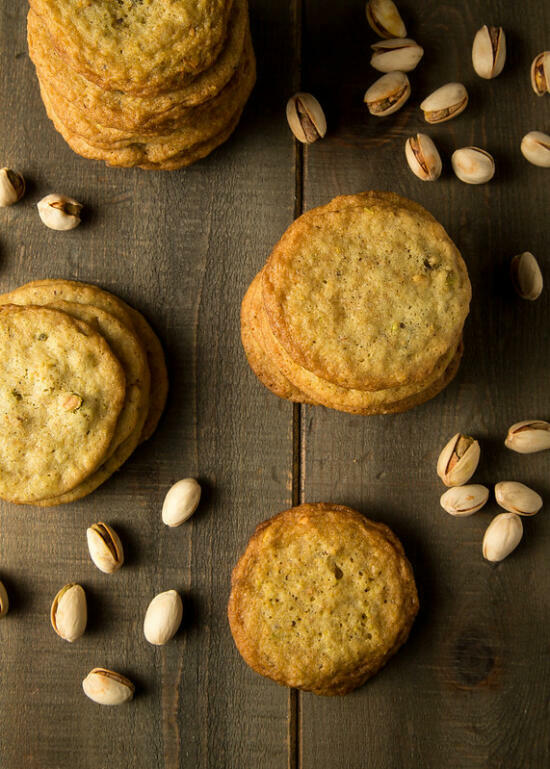 Before I made these, I had been expecting a pistachio-flavored cookie. What I actually got was more of a sugar cookie, studded with pistachios. Also still very delicious! If you want a subtle pistachio taste, these are great. 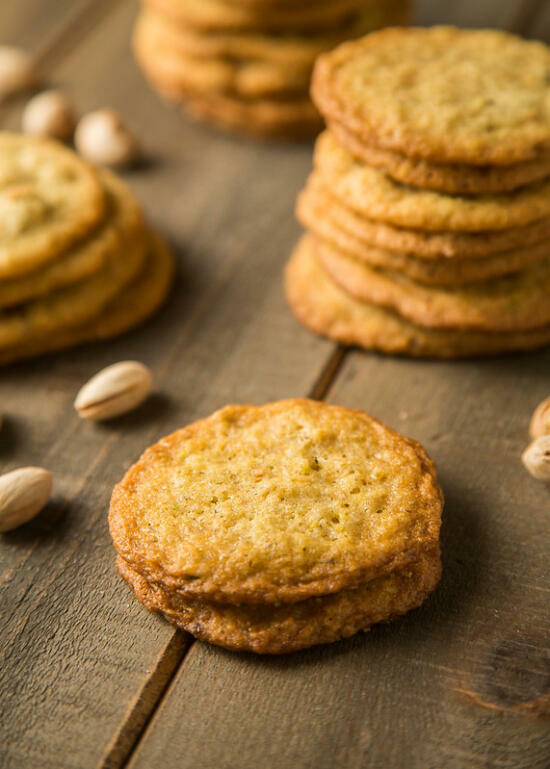 But if anyone has a recipe for pistachio cookies that are more pistachio-heavy, I’d love if you shared! In the bowl of an electric mixer fitted with the paddle attachment, cream the butter and sugar until the mixture is light and fluffy, 4 to 5 minutes. Add the egg and vanilla extract and beat until combined. Add the ground pistachios, flour, salt and baking soda. Mix until the ingredients are fully incorporated, 1 to 2 minutes. 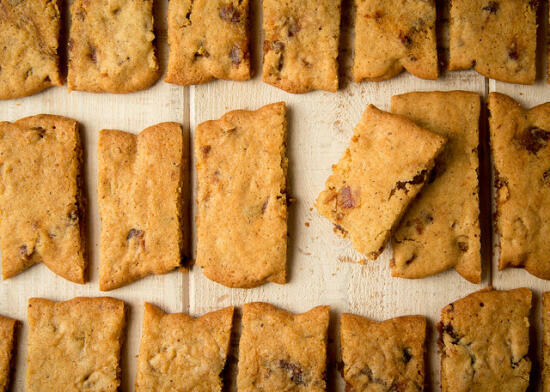 Scoop rounded tablespoons of cookie dough onto the prepared baking sheets. Press the dough lightly with your hands to flatten, then garnish each cookie with 1 teaspoon turbinado sugar. Bake until the cookies are golden on the edges, 7 to 9 minutes. Transfer the cookies to a wire rack to cool. The cookies will keep in an airtight container at room temperature for up to a week.